The great thing about the holidays is that you have so many left over pieces from the ham and the turkey to turn into soups and stock. I made a soup last year with the ham bone that was good, but not great. I wanted more to it. I set out to find a new recipe and came across this one. I changed mine some so I'll list my directions below. 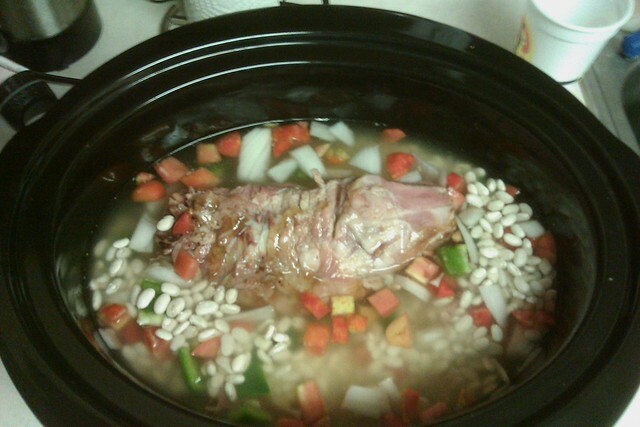 1.Place the ham bone, onion, tomatoes, kidney beans, potatoes, and green pepper into a 3 quart or larger slow cooker. Dissolve the bouillon cubes in water, and pour into the slow cooker. 2.Cover, and cook on low for 8 hours. I used navy beans since that's what I had on hand. I also used dried over canned since they hold up better in the slow cooker. Because I used dried I also upped the amount of liquid. I don't have a picture of the finished product, but it's also one of those that doesn't photograph well. This soup turned out amazing though. I probably could have gone back for seconds. It had great flavor from the ham and was thick and hearty.